The Wolverhampton charity POWER PLEAS will celebrate its 30th year in style at the home match versus Blackburn Rovers on Saturday 22nd April 2017. 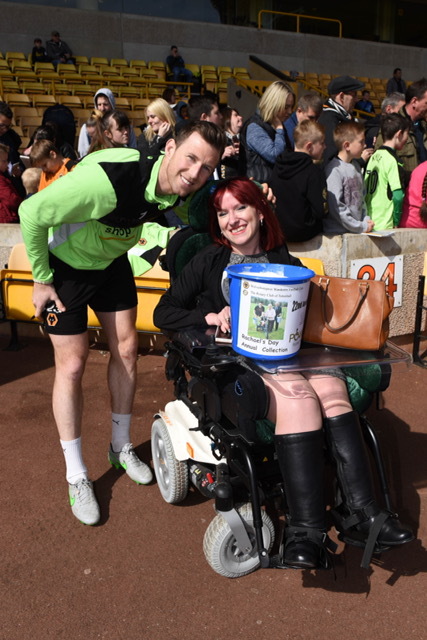 At half-time there will be a lap of honour and in the procession will be users of the powered wheelchairs that the Charity provided in its early days, children using Trikes that have been provided recently and players from two Wheelchair sports teams that have been supported by Wolves Aid and POWER PLEAS. 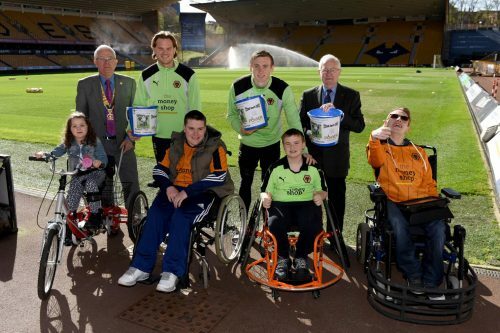 All of this is due to the initiative of The Late Baroness Rachael Heyhoe Flint who started the Wolves Wheelchair collections in 1995. 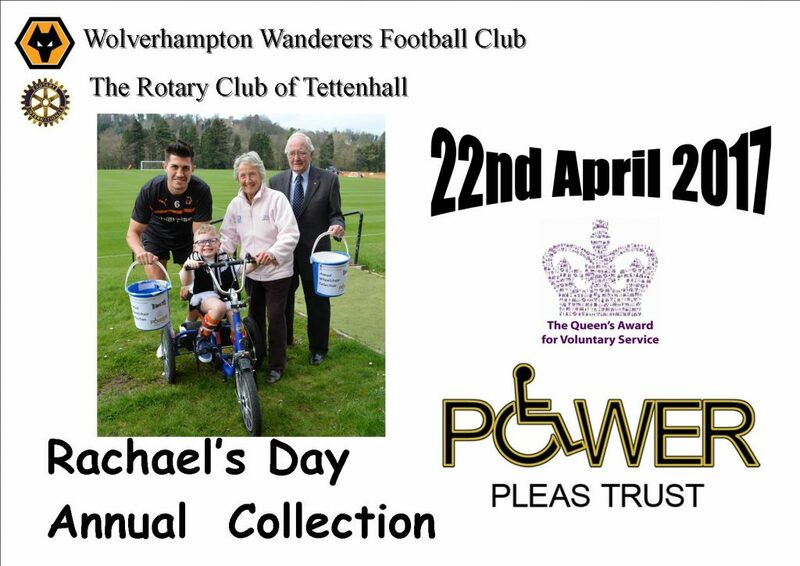 There will be a pre-match collection and the friends and families of recipients will be joining Tettenhall Rotary Club members to raise funds for the next initiatives of the Charity. Top of the list will be a wheelchair for a powered wheelchair football player that costs in the region of £7,000. The Charity, assisted by the massive support of the late Baroness Rachael Heyhoe Flint, provided four wheelchairs for the team six years ago and they desperately now need four more in order to compete on a level playing field with their competitors in the National League. John Margetts, President Tettenhall Rotary Club, Wolves players Richard Steadman and Jon Dadi Bodvarsson, Eric Johnson, organiser from the Rotary Club for over twenty years, join Scarlet Baker, Trike Rider, wheelchair basketball players Callum McEvoy, Harry Evans and powered wheelchair footballer Jack Smith for a photocall. 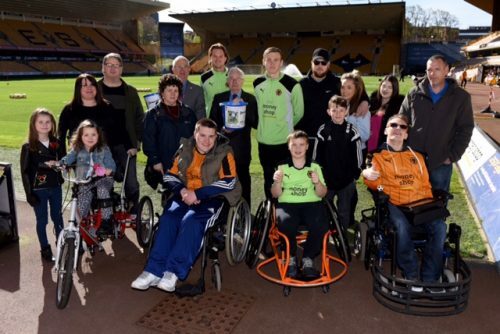 POWER PLEAS recipients joined by family and Wolves players Richard Steadman and Jon Dadi Bodvarsson in advance of the collection for a powered wheelchair for a local footballer. Rebecca Raymond-Barker and Mike Williamson supporting the collection. Rebecca was the third Wolves Wheelchair recipient in 1997.